Three Wabash seniors were honored Saturday morning with the College’s top honors for a graduate. Jacks was a psychology major and independent. He was elected to Phi Beta Kappa his senior year. He appeared in numerous Wabash theater productions. He will attend University of Wisconsin for graduate school. For the first time since 1996 there were co-winners of the Frank Hughs Sparks Award for attitude and contribution to the life of the College. Chris Ogden, from Schererville, and Jared Bogan, Struthers, OH., were the 2006 winners. The award is named in honor of Wabash's eighth president. Bogan was a history major, Lambda Chi Alpha member, and baseball team participant. He was honored May 11 by being named to ESPN The Magazine’s Academic All-District V Baseball Team. During Awards Chapel, Bogan won the John F. Charles World History Prize, Caleb Mills Teacher-in-Training Excellence Award, Pete Vaughan Outstanding Athlete Award and Indianapolis Alumni Student Athlete Award. The Dean’s breakfast concluded with remarks from Dean Raymond Williams. The College Dean reflected on his senior luncheons with more than 100 members of the graduating class. Seniors were asked about the most important aspect of their Wabash College education what should be preserved for the future. Williams said the characteristics most mentioned were the "rigor" of the college, the Gentlemen’s Rule, the College’s size and the opportunity to experience an expanded world through study abroad and immersion learning programs. He related those characteristics to the College mission statement and called those words the charge he would leave the Class of 2006 with as they enter the world. 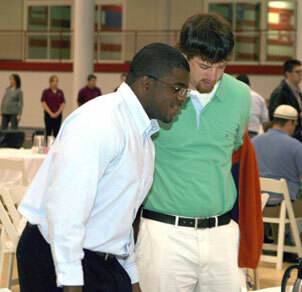 Above: Seniors Tamarco White and Aaron Selby, football teammates, enjoy breakfast together. On homepage: Jacks receives his award from Dean Williams. On Alumni page: Associate Director of Alumni Affairs Mike Warren presented the 2006 class members an alumni pin as they entered Saturday morning's breakfast.